It slipped! and I flew! Such words did I mutter! But the pathway was blocked! This job would be aced! I missed the cookie party fun. And choose the right tools! Have a healthy Christmas night! According to the Center for Disease Control and Prevention (CDC), 8,700 people were treated in emergency departments in 2002 specifically for decoration-related ladder injuries. Don’t become a statistic this year. Follow these tips for a healthy and happy holiday season. As you hang lights and decorations, use a step-stool rather than furniture for items that are slightly out of reach. Never stand on any furniture that is not stable. Make sure that the stool is locked into the open position. For higher tasks, use a ladder that is in good condition. For every 4 feet that the ladder reaches up, the base should be 1 foot away from the wall. Follow all height and weight restrictions that are posted on the ladder. Do not climb above the maximum height posted. The ladder top should extend 3 feet above the surface you are trying to reach. When climbing the ladder, face it directly. Keep balanced over the middle of the ladder. Do not overextend your reach. Place the legs on a solid and level surface. If the ground is soft or uneven, use a plank of wood to provide stability. Use proper body mechanics to avoid back pain when lifting boxes. Ask for help when lifting heavier objects. Hold objects close to the body, not at arm’s length. Do not lean forward at the hips when picking up items from low surfaces; rather, squat down, hold the item close, and use the strength of your legs as you stand up to lift the item. Do not twist or turn at the waist. Your toes should always face the surface that you are lifting the object from or placing it on. Avoid excessive clutter that can cause you to trip. Place electrical cords away from general walking pathways or tape them down. Do not overload electrical circuits. Keep walkways clear of boxes and decorations. Avoid rushing through the holidays. Perform activities requiring the most safety awareness when you are alert and relaxed. Be safe! Be Healthy! Happy Holidays! Had some fun with this a few years back. For all the computer users out there….Enjoy! Keep those fingers relaxed on keyboard keys. And keep those fingers relaxed on keyboard keys. Planning on doing some shopping for the holiday season? Black Friday and Cyber Monday are upon us. Here are some shopping suggestions to help you choose the perfect gift of health for family, friends or co-workers who suffer from the pain of carpal tunnel syndrome, tendinitis, or arthritic hand joints. Or maybe you deserve to treat yourself?? As computers and portable devices have become smaller so have keyboards. This makes it more difficult to maintain a good, neutral wrist posture while typing. Those keyboards that have the inverted “V” down the middle help align the fingers with the forearm easing tension on the sides of the wrist and preventing wrist pain and tendinitis. Using a mouse that is turned onto its side places the forearm in a more neutral position and can ease mousing pain. Although the portability of laptops make them a wonderful choice for those on-the-go, inherently the design will place either stress on the arms or stress on the neck. When at home, turn your laptop into a more ergonomically friendly desktop device by using a stand with an accessory keyboard. Many people write with tension. Using a larger barreled pen such as the Dr. Grip, a felt-tip pen that writes smoothly, or an ergonomically designed pen such as the PenAgain can ease thumb pain and hand cramping. For an at-home-spa treat, a paraffin bath is not only good for relaxation but can help ease the deep ache caused by many hand injuries. Also, heat is good for increasing the flexibility of joints, easing joint pain caused by arthritis, and enhancing the softness of a thick scar. Seen on many athletes, therapeutic tape does not bind the joints for support the way athletic tape does but rather lies on the muscle belly. The oscillating pattern of the adhesive, as well as mild stretch, lifts the surface of the skin, increases lymphatic and blood flow to the area, and relaxes the tissues around the superficial free nerve endings – providing some instant pain relief for most people! Instructions for application are usually provided in the box. There are also multiple online videos that show proper application. Or, for that matter, any electronic gadgets that can ease the work that the hands do….electric can-opener, electric jar opener, electric knife. Often these products can be found at discounted prices during this time of year. The OXO brand is a good example of a company that has designed products specifically for arthritic joints and those with hand pain. The handles are larger and softer. Bed, Bath and Beyond usually has a large display of the various kitchen tools. WhateverWorks.com is a website with a paper catalog that offers functionally based produces. I’m really liking this new product that provides a sure grip while easing the tension of holding larger smart phones. Both heat and cold can temporarily change the way that pain signals travel along the neural pathway to be recognized by the brain. Cold is great for acute inflammation while heat can be good for more chronic pain, particularly a nervy type of pain. Head Space, Breathe 2 Relax, Desk-Yogi, Stretch Break programs – there are many free and paid apps and subscriptions that can provide guidance in relaxation techniques, meditation and mindfulness programs, deep breathing techniques and stretching programs and stretches that will help reduce muscular stress and tension. Even after many years of practicing as an occupational therapist specializing in hand and upper extremity rehabilitation, I’m continually surprised when our clients arrive at their initial visit assuming that therapists will cause them pain. Before I even sit down with them for the first time, clients may already in a state of emotional distress that interferes with the therapeutic process: overly medicated with either prescription or non-prescription drugs or alcohol; overly angry or anxious or tearful; or with an entourage of friends and relatives and significant others surrounding them for support and protection. Each time this happens, I tell myself that I shouldn’t be too shocked as our culture does tend to support the philosophies of “No Pain, No Gain” and “More is Always Better”. And our clients’ reports of previous encounters with healthcare personnel demonstrate that these philosophies are alive and thriving in our medical community. One common complaint I hear is of experiences with heavy-handed therapists resulting in physical bruising and actual nausea-inducing pain. Several clients have shared discussions they have had with a physician who instructs them to wear splints that stretch a stiff joint “to the point that it brings you to tears”. And recently, I’ve heard reports of a physician assistant who tells patients with repetitive strain injuries that they should have more pain following an exercise session or they are not performing the exercises correctly. To be fair, some joints do require a more forceful approach as do more established joint contractures. Patients undergoing therapy for knee and shoulder injuries will often joke of seeing their physical or occupational “terrorist”. But these joints often tolerate the trauma and the swelling caused by an aggressive approach much better than the hand does. The hand has so many structures that are so perfectly aligned that any increase in trauma or swelling seems to impact the perfect balance of function. I won’t lie and say that hand therapy is or should be completely pain-free. As much as we don’t like pain, it does serve a purpose: pain serves as a warning system that something is wrong; pain helps us know how far to push our limits; pain encourages us to rest an injured body part for healing purposes. As therapists, we are often dealing with recent injuries, wounds, swelling, trauma. We often see people within the first few weeks of an injury. Occasionally we will see people the day after a surgery. In our quest to establish the best possible outcome for recovery, we may have clients performing activities or exercises in a controlled way that may intuitively seem wrong (yet we know will not compromise healing). So it is normal that we do treat people who are in pain. However, our goal with therapy should be to minimize and control pain while promoting healing. If my expectation and purpose with therapy is to ignore or to actually promote pain, I will likely find that my treatment backfires. If I’m “cranking” on a swollen and recently injured joint, I’m going to potentially create more stress to the injury, create more swelling, generate more scar formation, possibly promote a pain-syndrome that goes beyond the bounds of a normal pain response for that particular injury. If a tendon is inflamed from overwork or a nerve is compressed and I have someone exercise to the point of pain, I’ve done nothing but further the damage by increasing stress on tissues that were already breaking down. In my opinion, a program of gentle persistence will always trump aggression. And we have good results following this philosophy. For example, take a stiff joint to the end of the range of motion and then nudge into the tightness; perform that motion for 2-3 minutes every hour and you will create tissue change without creating an increase in physical stress to the injured structures. When wearing a splint to stretch a tight joint, going for a lighter tension for a longer period of time will yield results more effectively than than a short, painful stretch. And when dealing with inflamed tissues, performing gentle stretches and nerve glides for the irritated tissues while promoting muscular balance by exercising the opposing muscle groups and strengthening postural muscles will promote healing. In spite of common belief, hand therapy does not necessarily need to be painful. Hand therapists should not be feared. We can achieve good results in the clinic with persistence rather than aggressiveness. The relief people feel is palpable when they realize that we are here to listen, collaborate, sympathize, share and educate rather than to “crank” on them. Happy New Year to all of our social media friends! I took the holiday time to clean and organize the clinic. It always feels good to go into the new year feeling prepared. I wish all of our Facebook and Twitter followers a year of health, adventure, learning, and good memories. In an attempt to improve quality of care, Medicare is now requiring that all of our patient encounters address nine aspects of care (the PQRS measures that pertain to occupational therapy). This is a huge change from the three that were required last year. While I certainly agree that quality of care can be enhanced by addressing such medical issues as obesity, alcohol abuse, nicotine use, depression, risk of falls and elder abuse, I do question whether an outpatient occupational therapy clinic focused on upper extremity rehabilitation is the correct place to bring up some of these issues. Our hand therapy clinic is not the first line of defense in medical care. By the time our patients reach us, they have had possible encounters with ER or urgent care personnel, their primary care physicians, rheumatologists, upper extremity or orthopedic specialists, imaging and radiology personnel. Our patients are already overwhelmed with all of the paperwork that is required at each of these facilities (intake forms, health history, notice of privacy practices, notices of patient’s right and responsibilities, functional assessment forms). And now we are being told that we, as occupational therapists, need to take height and weight for a Body Mass Index, ask about alcohol and tobacco use, ask about history of falls, and administer a depression screen and an elder abuse screen before we can even begin to address the reason that our patient was originally referred to our hand therapy clinic. I anticipate that these screenings will be a time-consuming and frustrating process for the therapist as well as for the patient who just wants to focus on what they can do to make their upper extremity injury better. I spent many hours over the weekend reviewing the PQRS measures and developing a checklist that will hopefully meet Medicare requirements while not being overwhelming for either the therapists or the patient. However, I would love to hear how other clinics are addressing the issues. Or how clients feel about these changes. Any tips? Advice? Stories of how addressing these issues made a positive change (as I’m trying to keep an open mind)? Any thoughts on how to best handle the counseling or referral process if any of the measures requires intervention? It will be interesting to check back in a year, to see the impact of PQRS on our small clinic. At best, I’m hoping to discover opportunities for growth and expansion. At worst, we will just survive the additional paperwork. In the meantime, I’m looking forward to hearing from you. Best wishes for a happy and healthy year! The wrist joins the hand to the forearm. It is able to move forward and back, side-to-side, and in circular movements. This variety of motion allows the hand to reach objects and function in a wide range of motion. In addition, a strong and stable wrist is important during grip activities.The wrist is a complex joint where the two long bones of the forearm meet the eight small carpal bones of the wrist. These carpal bones are essentially arranged in two rows of 4 bones. The eight small wrist bones then meet the five long finger bones in the palm of the hand. Most of the muscles that move the wrist, fingers and thumb are located in the forearm. The tendons (the cords that connect muscle to bone) that bend and straighten the wrist and the fingers must cross through the wrist joint on their way from the elbow towards the hand.Many of the repetitive strain injuries associated with computer work occur at the wrist. In fact, according to the National Occupation Research Agenda for Musculoskeletal Disorders, the most frequently reported upper-extremity musculoskeletal disorders affect the hand and wrist region. Pain where the thumb meets the wrist may be caused by a tendinitis of the muscles that pull the thumb back (as if you were hitchhiking). People who type tensely are prone to developing this tendinitis as they hold their thumbs over the keyboard with tension. Pain at the base of the thumb can also be caused by arthritis in the joint where the long palm bone meets one of the tiny wrist bones of the thumb. Tendinitis of the wrist and finger flexors (the bending/closing muscles) and extensors (the straightning muscles) and benign ganglion cysts also occur fairly frequently at the wrist. Maintain a neutral wrist position. The wrist should be flat in relationship to the forearm; it should not be bent forward or back. For each 15 degrees that the wrist is out of alignment, the pressure on the median nerve increases. The middle finger should be in alignment with the forearm, not angled toward the thumb or the small finger. Wrist supports can provide proper positioning during the night. Do not fight against a wrist support. It is better to remove the brace and perform activities carefully than to wear a brace that prevents necessary movement. Softer, neoprene braces without the rigidity provide support but also allow for some movement and may be a better choice is the task requires wrist movement. Using a wrist brace can cause the body to compensate for loss of motion by moving the elbows differently. Monitor for a shift in pain symptoms in other body areas. Using a split keyboard can align the wrists into a more neutral position. Try a negative tilt of the keyboard where the row of keys closest to you is slightly higher than the row farthest away. The keyboard height should allow the wrists to be neutral while the shoulders are relaxed and the elbows are open slightly greater than 90 degrees. Use the upper arm to manipulate the mouse. Do not activate the mouse by using side-to-side movements of the wrist. The mouse should be located by the keyboard. Do not reach forward to activate the mouse positioned on a different level than the keyboard or positioned out of easy reach. Keep the fingers and thumb relaxed on the keyboard. Use only the minimum necessary force to activate the keys. Do not float the fingers stiffly over the keyboard. The last several weeks have been really good weeks- those types of weeks where you just feel really good about your career choice; those types of weeks where you feel as if you are making a difference in people’s lives. The reason? We had several former clients stop by the clinic to say thanks and to let us know how they were doing. 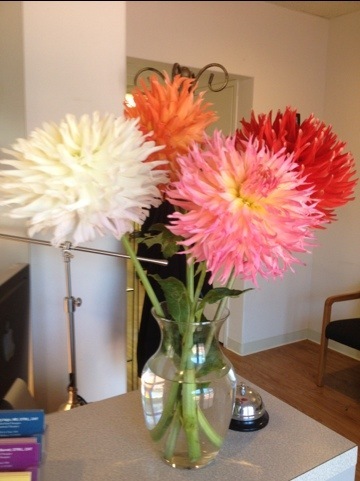 One brought us a bouquet of gorgeous Dahlias. He has one of the largest collections of Dahlias around. He continues to treat us with these beautiful flowers even 3 years after he graduated from hand therapy because of the positive impact we had on his life during a difficult time. And this case is not unusual. Some common refrains that we hear from our clients are: you provide me with the knowledge I need to recover from my injury; I don’t feel as worried or frightened about the injury and my recovery because I now have that knowledge; and I wish I had known this information earlier. Unfortunately, as healthcare changes, I see a trend towards fewer referrals, towards fewer people receiving the benefit of our experience. We are having to fight harder to receive authorization for fewer visits with less reimbursement. In spite of my good weeks, now I am the one feeling worried and frightened ….about the future of my profession as an occupational therapist and a certified hand therapist. A few examples of this trend: (please note that these examples are based on situations with physicians who do not regularly refer to our clinic) Last week I worked with a client who returned to the clinic to be treated for a right carpal tunnel release about 6 months after being seen for her left. She felt she had progressed very well with the previous therapy, returned to work almost immediately post surgery, and was quite pleased with her end result. She assumed her physician would refer her once again for therapy for this recent surgery on her dominant hand. The physician did not. At her second follow-up visit with the physician, surprised that therapy was once again not mentioned, she requested it. Her physician reluctantly wrote a prescription “but for only a few visits”. She was glad to have these few and upon completion, she requested a few more feeling that she had just a bit more work to do with us. Based on early return to work with residual swelling, scar thickness, limited grip and pinch strength, and a moderate pain level with typing, our progress note to the doctor also reflected that a few more visits would be beneficial. However, her physician told her that she should be grateful for what she got as this particular physician only refers 1% of patients to therapy. 1%! I think I recall coming across a statistic a while back that most hand surgeons refer about 10% of their caseload to therapy services. (I have not been able to find this source again. I would love to have this confirmed if anyone out there has information). So what is happening with the other 9% of the patients that are not being referred? Are they receiving sub-optimal results? Taking longer to recover? Staying out of work longer? Just getting by? Finding information on the Internet instead of through qualified personnel? Having multiple questions that go unanswered? Putting energy into worries that can be resolved with education? And, if people are being seen by physicians who seem as callous as in these two examples, I don’t think that a session or two of our “hand holding” is out of order. Why does medicine need to be so cold and unsympathetic? And why do some physicians believe that it is more effective that way? And for those physicians who believe in our services, even they are being impacted and discouraged by the hounding of insurance adjusters, multiple phone calls received, and the increased need to prove medical necessity (often to ridiculous degrees). It is becoming easier for even them to not take out the prescription pad. Dr. Roy Meals referenced a study in his newsletter that he believed every hand therapist should be aware/wary of. This study “proved” that wrist fracture recovery was better without the “coddling” of physical or occupational therapists. Of course, the control group (those who did not attend therapy) were seen for frequent follow up visits with a physician who spent 10 minutes each appointment providing them with exercise instruction. Unfortunately, all of the physicians who refer to me do not have that luxury anymore. They count on us to provide eduction and home program instruction. But, if insurances can use this study to deny treatment, do you think they will make that distinction? I sure don’t. So, what can we do to offset what seems to be an increasing disbelief and disrespect of our services? I personally don’t know what the answers are. Maybe insurance companies (who i believe to be the driving force behind this ennui) are just too big to fight. But in the meantime, I will carry-on at a grassroots level by trying to promote my profession, by returning those annoying calls to adjusters, by answering questions and providing education, by suggesting that my clients tell any and all about the value if services that they receive from us. I will support our local and national organizations who can fight at a political level. And I will hope for the best because I want to continue to have these good weeks.